Once you see how easy it is to design a website and get up and running using WordPress as well as how cheap it can be especially with using a host like Hostgator or buying domain names from 1&1 (which at the time of writing this post was actually .99 cents for a year!) – you will eventually begin to create multiple websites. I currently manage over 20 websites. That may seem like a lot, but I know some people that manage over 100! Imagine having to update every plugin, theme and wordpress update. It’s important to update all of these, because if you don’t you are leaving yourself open to hackers breaking into your site. At some point, you will have so many, that you will need a system for updating and keeping track of all of them. This is where a WordPress Management System comes into play. WHAT DOES A WORDPRESS MANAGER DO? So now that you know what they basically do, lets go on to my review. Below are the ones I was able to test, and this was my personal experience with them. Please note, that there NO AFFILIATE LINKS to these WordPress Managers. Setting up ManageWp was fairly easy. You just upload their plugin and add your website to their dashboard. 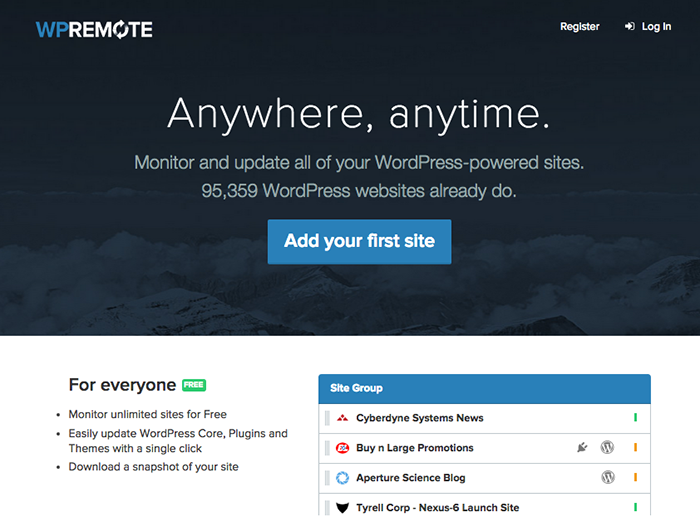 I added two sites to Manage WP. One of my sites, had problems synching up. I emailed support, and they informed me that it was probably because I was using another WordPress Manager plugin that was causing a conflict. I disabled that other plugin. After a few tries, I just gave up. But I did have another site to test this program with. 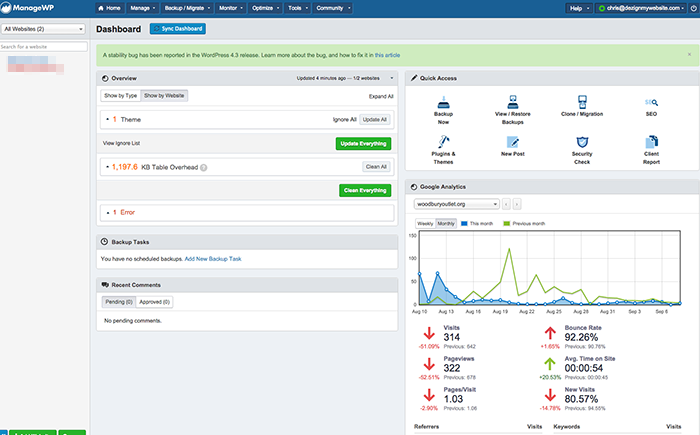 ManageWP does the usual WordPress manager tasks like letting you add posts, updates themes, plugins and lets you do back-ups. It can also perform security checks and does a performance report to let you know how fast your site is loading. The cool features that I saw had more to do with SEO. For example it would track your keyword rankings and perform some other onsite tasks such as checking for broken links. However, to get these features, you have to pay more. And I think there are other tools that do these tasks more in-depth. They have a three different tier pricing structures. Standard, Professional and Business. And the more websites you use with them, the cheaper it gets. For me, I have 20. So for the Standard it was $0.65 per site. Professional was $1.95 per site. And for Business it was $3.90 per site. The Business package was the most interesting to me, since it had the ability to do SEO tasks. The dashboard was clean and had a lot of different features (if you use the Business Package). For me, not being able to sync up one of my websites was just a non-starter. Even after I contacted support, disabling other plugins didn’t fix my issue. I’m sure had I kept at it, they would have solved it. But for me, problems from the get go, is not how I want to be spending my time. I also don’t like their pricing structure. This manager has the best interface. It’s clean and you aren’t overwhelmed on-screen with all the different options. CMS Commander does the same thing the others do such as updates, posting and back-ups. Some interesting features I didn’t have time to experiment with were features such as their free content sources for images and videos that you can use on your sites. They also have affiliates you can plug into your site as well. Again, I didn’t get a chance to experiment that with that, but for me, I’d rather use other programs to do those tasks. Just like ManageWP, I did really like that they had SEO features such as backlink checkers (which they use SEMrush) and the integration of Google Analytics. When logging in, you really feel like you are in command. The interface is very clean. I really wanted this program to work, because I really enjoyed everything it had to offer. However, on one of the sites I uploaded that needed an update… it failed to update. Instead, I had to go to the admin section of the site myself and update from there. Well, what’s the point of a WordPress manager if it can’t even perform that simple task? Then I had the same problem I had with ManageWP. I had another site where the data wasn’t being downloaded. Again, if I was having this many problems now, what could I expect for the future? I really like that the pricing didn’t have different tiers in terms of features. Whatever you pay for website, you get all the features. In my case, for 20 websites, they charge $16 a month. That comes to about $0.80 per site. Looks wise, feature wise and price wise, this was my favorite. However, it didn’t work properly when I was testing it out. So unfortunately, this wasn’t the one for me. iControl set-up was a breeze and even adding sites was easy. Many of the other WordPress Managers had errors when trying to add sites. After playing around with iControl, it does pretty much what others do. It lets you view all your sites at a glance. It lets you update plugins and themes. The one difference it has from the others, is that it uses a system called WorpDrive to back up your sites. I didn’t get a chance to play around with this back up system. Overall, nothing too fancy with iControlWP. But it seemed very reliable from my initial testing. Their pricing wasn’t too bad. They charge $0.95 per site and don’t have different features for different prices. Everyone pays that price for all the features they provide. When you go to the WP Remote site, their features are a little vague, as well as their pricing. At the time of this article, I was unable to find the price on the main site. However, you get a free 30 day trial to test it out. So I did. It was easy to install, however I did run into a big problem. The program had a conflict with the Wordfence plugin. I value security more than ever now, and having Wordfence running on my sites is something I must have. So for a WordPress manager to have a conflict with this, is not great. Because of that, WP Remote wasn’t for me. And finally, we have Infinite WP. I would say this is one of the most popular manager’s around. Installation didn’t go as smoothly as I had wanted. This is one that you actually install on your own server. There are pros and cons. The pros is that you are handling it. The cons is… well… you are handling it. And if you don’t trust your own host, then this may not be a good thing. Once I figured out these hiccups, I was able to move onto the dashboard. Once again, there was an error. Since this is a program you are running on your own server, you have to set up your own cron jobs. If you look at the top right of my picture, you will see the cron job error. Basically what this cron job is for, is to email you updates. I followed the directions on how to set up the cron job, and it didn’t work. I emailed Infinite WP and they said that it had to do with Hostgator. I thought to myself, Hostgator is one of the biggest hosts in the world, wouldn’t they test to make sure it works with them? The way Infinite WP works is they allow you to use their main dashboard for free. However, they have addons that you have to pay for. For example, do you want to back up your site? Do you want to perform security checks? If you do, you have to pay for each additional feature. A lot of them had features that I really liked that would have been cool to see. However, it either was too costly, or just performing simple things like a regular update didn’t work. Which is really the point of having this manager. iControl WP worked exactly how it was suppose to work. If you don’t want any hassles, and just need a manager to perform updates, backups, bulk post administration and you don’t mind paying $0.95 per website, then this is for you. The one I am currently using is Infinite WP. Yes, it gave me the cron job error (and still does). However, it’s FREE. All those other features such as back-ups. I don’t need, because I back up my sites with Back Up Buddy. Now maybe if I didn’t have Back Up Buddy, I may go with iControl. But being able to just see all my sites at once for FREE is pretty great. So for now, I’m using infinite WP. I highly recommend you trying one of these WordPress managers. You may have different experiences than me.